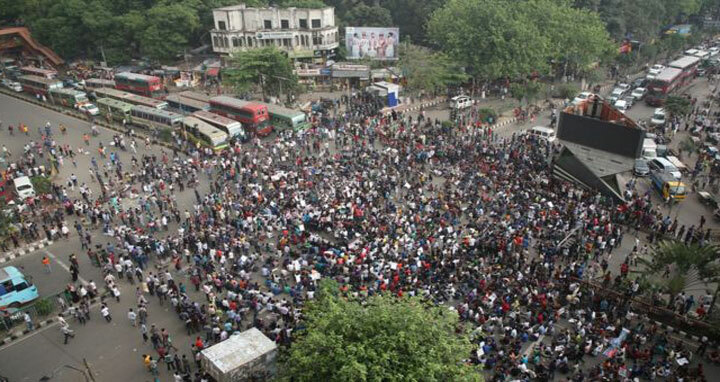 Dhaka, 12 August, Abnews: Students seeking quota reform on Sunday threatened to go for tougher movement if their three-point demand is not met by August 31. Bin Yeamin Mollah, a joint convener of Bangladesh General Students’ Rights Protection Council, the platform of students that led the quota reform movement, came up with the ultimatum from a rally in front of Shahbagh National Museum. “We’ll go for tougher movement if the government does not take any steps to meet out demand within August 31 and the demonstration will spread across the country,” said Yeamin. Their demands are: Immediate release of the activists, who were detained during movement, from jail, punishment of the attackers involved in assaulting teachers and students and publish a gazette notification of quota reform in the civil service in line with their earlier five-point demand. He also urged the government to arrest the assaulters who attacked the protesters and release the detained students before Eid. Hasan Al Mamun, a convener of the council was, among others, present there.